High velocity/low volume hand power tool extraction system to remove dusts and debris generated by sanding, grinding, routing processes within Aerospace, woodwork, shipbuilding and other industries. Systems which require an allowance for a high pressure differential which is dictated by the production machine, such installations include pharmaceutical where the system is required to remove dusts from blister, tablet and de-dusting machines. Provision of a nozzle at the drill/cutting head on Printed circuit board or optical lens manufacture so that the swarf generated is removed at source and conveyed to a plant away from the production area. 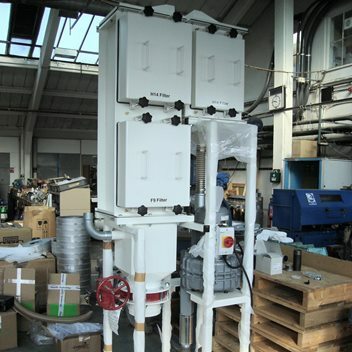 Lean phase conveying systems to transfer products from generation or storage to further processing. Providing airflow at the correct material entrainment and pick up velocity from remotely operated vehicles (ROV) usually within hazardous environments where personnel are not normally allowed to be present – Hazardous decommissioning projects, typically in the nuclear industry.